The train ride from Zell am See to Millstaetter See in Carinthia (Austria's southernmost region) provided the most unforgettable and dramatic scenery of our entire voyage. We wove around forested mountains looking down at lush valleys and rocky gorges with racing rivers and small immaculate villages with splendid homes climbing up the green mountainsides. 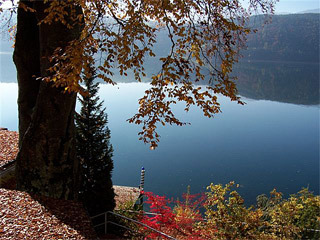 The train pulled into Spittal an der Drau which is located on the southwestern corner of the lake. Since we would be staying in Obermillstaett high above the Millstaetter See, we decided to check our bags and visit Spittal while we were here. The Porcia Castle and garden was our first stop. The 16th century Renaissance castle has a beautifully sculptured main entrance and a large attractive courtyard with arched pillars and curved balconies. Proms and productions of classic comedies are held here in the summer and a choir concert competition is an annual event. The gallery of the courtyard is used for art exhibits. The upper floors house the Museum of Folklore with exhibits and programs for children to experience the history of upper Carinthia. The Rathaus across the way, also 16th century Renaissance, has a lovely open courtyard. It is a social gathering spot with a cocktail bar and tables; its especially popular in warm weather when its architectural design keeps the temperatures cool. The Technikum Karnten is a university for the study of architecture. There are about 200 students from Austria and neighboring countries. The large main lobby was being prepared by members of the Army for the evening Army Choir performance. A gorgeous red stone building at Neuer Platz 17 caught our eye and we discovered that it is a 100-year old home that is a family owned and operated restaurant, Mettnitzer. How lucky - we were ready for lunch! The architecture and design of the magnificent rooms have been retained and it is like dining in an ancient palace. The menu of traditional and seasonal favorites made the choices difficult. We both decided to start with pumpkin soup and try the house specialty, karnter kasnudel, the local version of agnolotti, which is filled with quark and herbs in brown butter, served with a large green salad. Apple cake with cinnamon ice cream and schlag was a delicious finish to a marvelous, fairly-priced lunch. When we stood on the expansive, sun-soaked terrace of the Biohotel Alpenrose, 900m above Lake Millstaetter See, breathing the crystal clear air, the aura of peace and contentment was palpable. Was it the longer than usual hours of sunshine and warmth or the protection provided by the Tauern mountain range or the Mediterranean jet stream that flows from the south? Whatever the reason, the feeling and the view were amazing. Biohotel Alpenrose is located on a south-facing slope on a sunny plateau amidst lush meadows with incredible views of the lake and mountains. We noted that every lounge and chair on the deck, poolside and on the grounds, was facing south and on the lower level along with a wellness center was a "silent sun room", with direct entry to the pool, which captured the suns rays streaming in through the windows. Catching the November sun seemed to be a very popular activity with the guests. Linda was very happy to find a washer and dryer, which is available to guests for a nominal fee. There is a TV room off the lobby area but no TVs in the guest rooms unless requested when reservations are made. There is no elevator but the staff is more than happy to help with your luggage. Our bedroom was beautifully done in light woods and white with a gorgeous south-facing view over the lake and mountains from our small balcony. The excellent quality of the woodwork and furniture was particularly impressive. The built-in closet space was more than adequate for a long stay. The toilet room and bath/shower room were sparkling clean and stocked with amenities including bathrobes. The family Obweger-Theuermann and the staff make the hotel a special retreat. They are truly committed to the care and well being of their guests. 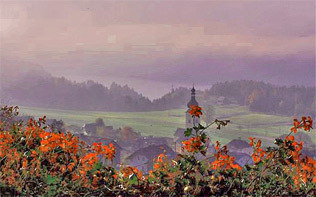 Surrounded by organic farms which grow their own medicinal herbs, The Alpenrose was Austria's first bio-non-smoking hotel. Guests returning from their outdoor activities may choose to take advantage of the healing power of precious stones, medicinal herbs, pleasant herbal baths and healing massage available in the wellness center. We had dinner at Buschenschenke Hoefler, Waldweg 6, Millstatt. This is one of the category of farm restaurants that can open only at limited times during the year and sell only the products grown and produced on the farm. A straw bush indicating they were open was hanging on the sign as we turned onto the road leading in through the forest. The tables were filled when we arrived except for the place reserved for us. The Familie Unterlerchner where happily preparing and serving the obviously ravenous patrons. The beverage of choice here is Apfelmost, apple cider, and it is fresh and delicious. 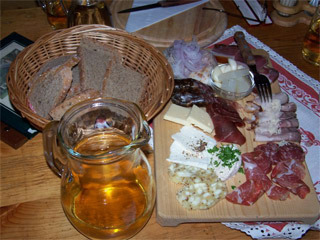 We had a wooden platter of assorted smoked meats fresh cheese, liver pate, pickles and a bowl of cooked garlic buds. All of this is of course eaten with large quantities of crusty dense bread. This was truly an authentically Alpine experience. It's difficult to write about one meal after another, but in this case it is really easy because breakfast at Alpenrose was special. The tables and chairs were dressed in a pretty white embossed fabric and the table settings were of quality china and flatware. The healthy buffet was comprised of a selection of the finest quality organic products. Freshly pressed strawberry juice was an awesome starter. The soft boiled eggs were the largest and freshest I have had since I was a child. Fresh fruit salad was carefully prepared from a flavorful selection of delicious specimens. Each of the large variety of nuts was crunchy and fresh. There was cheese for every taste and the meats were as lean as could be. All the organic vegetables, jams and jellies were wonderful as were the breads and rolls. There were some exquisite looking pastries but enough was enough, even for us! Along the way we had met many Austrians who had great curiosity about Canada. We had met one such woman at the train station when we were checking our luggage and she offered to spend some time with us the next day, to show us why her lake and mountains were so special. In exchange we would tell her all she wanted to know about our country. As she guided us around the mountains she more than proved her point. The Millstaetter See is nestled in the mountains of Nockberg National Park - lake and mountains, constant companions. Driving through the forests and we were enraptured with ever-changing, gorgeous vistas including the crystal clear lake sparkling below. While skiing was the major focus in Tirol the opposite is true here. Yes, there are numerous slopes and lifts just twenty-minutes away and with one ski pass you can hit them all. But the real thrill is to embrace this paradise between spring and autumn. Start with a lake of drinking-quality water with a high mineral content, add some sunshine and youve found a perfect place for swimming. Next season (2006) there is a program called "Lake Touching" which will offer unusual opportunities for skin-to-skin contact with the water such as floating or swimming under the care of a trained water guide to experience the thousand-hand massage, aesthetic high diving or practicing Qi Gong at the lake. Then theres this unique experience: a boat will ferry the two of you to your own floating island, a raft in the middle of the lake, where you will be served dinner prepared personally for you by a top chef. Is that romantic, or what! There's a new twenty-eight kilometer track around the lake for bicyclers to discover the culture of the lake villages, the unspoiled nature on the southern shore. Explore the moor bath and mineral springs of the Mirnock, which is home to Austria's longest Kneipp water therapy footpath with twelve kilometers of water stepping basins and instructions for gymnastic exercises. 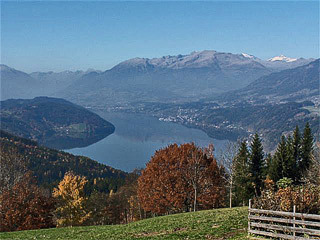 The "Friendly Mountains" contain 500KM of hiking trails and signposted mountain biking routes across the landscape between the lake and the high mountains and there is no better way to learn the secrets of the mountains than to wander through the forests and meadows and, with the lake always in view, the knowledge that you can cool off in the welcoming waters. At this point we wished we had planned more time here to wander the trails. As we twisted around the forested mountain sides the awesome colors and scents of autumn were in full bloom around us and we were thankful we at least had this opportunity to touch the mountains. Our friend drove us to Stanahof Baumgartner, Moosewald 20, Fresach, high in the mountains south of the lake. Mrs. Baumgartner and her daughter proudly welcomed us to their guest home, farm and mud treatment center. Mrs. Baumgartner discovered the therapeutic mud on the land when she was growing up on this magnificent property. She had always thought about developing her discovery into a treatment center until, finally, four years ago she had the mud scientifically analyzed and it was found to be of the best quality found in Austria. She went to Italy to study the techniques of working with the mud, and the proper handling and various uses and applications. Mrs. Baumgartner suggested a mud treatment for Linda, who eagerly agreed, so we were off to the outdoor clinic in middle of the mud fields. Passing her farm animals, Mrs. B stopped to chat with them. We walked on through the grassy meadow to a spot nestled in the trees where she had built containers out of wood and hollowed out tree trunks for the proper storage and handling of the mud. After the mud dried by the mountain air and the sun, it was washed off and Lindas skin had a lovely, healthy glow and she said it felt good. Mrs. B walked us over to another nearby mud field and described how she had once found a deer rolling around taking a mud bath in a spot he had dug precisely for that purpose. They have built a little wooden childrens playhouse, called Stana's Barenhaus, which is filled with a zillion teddy bears and other stuffed animals. Outside there is a barbecue, tables and play area for guests and visitors. Before departing, we had lunch overlooking the lake on the Alpenrose terrace - a lunch not soon forgotten. Fresh tomato cream soup and selections from a salad buffet was a good beginning. Pan fried, lightly-breaded, thick filets of Zander were the best ever rendition of this dish. The organic boiled potatoes, steamed young baby carrots and white asparagus were heavenly. We made wise choices from the dessert buffet - everything in sight! The apple and cheese strudels were amazing, but the homemade vanilla ice cream - incredible! Bio-Hotel Alpenrose has it all. Obviously, we have very fond memories of our short stay at the Millstaetter See. We had been planning to take the train to Klagenfurt but as it turned out our friend was driving to Graz for the long week-end and since Klagenfurt was on her way, and she insisted we keep her company. 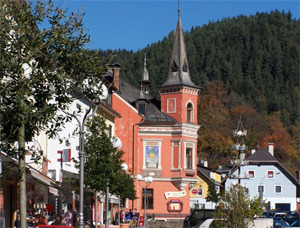 Passing through Spittal an der Drau, Kathy asked if wed be interested in visiting the Gabor factory outlet store. Hello! Gabor is a popular brand of shoes that originated in Slovakia with production there and here in Spittal. Linda found a casual, short boot she couldnt live without, at 40% off retail.